"One of the things I like about jazz, kid, is I don't know what's going to happen next." This beautiful quote is reminded to the audience by The Director-General of UNESCO Irina Bokova on April 30th in İstanbul. Before her, one of the most important living figures of jazz, Herbie Hancock, was in front of the microphone to make the opening speech. That's right! The All Star Concert of The International Jazz Day is held in İstanbul in 2013. As most of you know, organized by UNESCO, started in 2012, April 30th is being celebrated as International Jazz Day with many events all around the world. 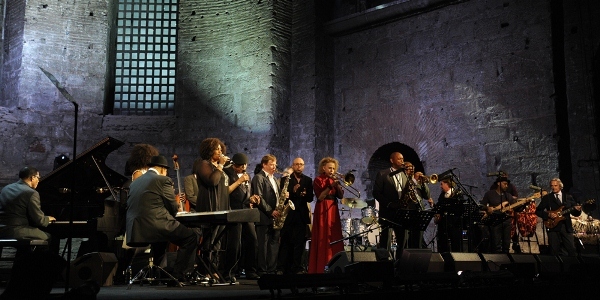 We, as some lucky and decisive jazz listeners, had found the chance to listen to forty important jazz musicians on the same stage in a single night in the historical place Hagia Irene, inside Topkapı Palace this year. There has been twelve different performances with various line-ups and I should mention that many of these gatherings were just like a dream. I should add that there were many other educational events held in İstanbul on this day including some of these important musicians. I think one of the most amazing parts of the night for Turkish listeners is that The Director-General of UNESCO Irina Bokova mentioned Ahmet Ertegün and Nesuhi Ertegün as founder of Atlantic Records and sons of first Ambassador of Turkish Republic to the United States, Münir Ertegün. Another important point for us was that there are qualified Turkish musicians right next to the legendary names of jazz: Imer Demirer on trumpet, Bilal Karaman on guitar and Hüsnü Şenlendirici on clarinet. We already know that Imer Demirer has a reputation in international jazz stage and is known by Herbie Hancock very well. For Hüsnü Şenledirici, I have to mention his great performances with Marcus Miller and Dhafer Youssef in recent years. Let me add that he has also taken stage in last North Sea Jazz Festival. When we come to Bilal Karaman, he is decided to be a part of last year's İstanbul Jazz Festival's special concert with Marcus Miller and performed with Lars Danielsson for another concert in the same festival. We have listened to Bilal Karaman and Hüsnü Şenlendirici with Dianne Reeves and Zakir Hussain in the all-star concert. Imer Demirer has been seen many times on the stage with many musicians. Surely, the night was not just directly about jazz and music. As I have mentioned in the beginning there were many speakers expressing their good wishes and messages concerning the importance of the idea of jazz carried in years. As Turkish speakers we have firstly seen Minister of Cultural and Tourism of Turkey, Ömer Çelik with a very short speech. He has used an interpreter and in my humble opinion, considering the translation, the irony in the beginning is too vulnerable to be misunderstood. What he was trying to say can be paraphrased as "There is a saying in Turkey that someone uses to express his/her boredom or complaint for a friend's foppish talk or behavior. One say <Do not make jazz> to his friend in this situation. Today I am telling you <Make jazz, as much as you want...>." First of all, this saying whose source is not known is hardly used in Turkish and it is generally used by the people that do not like jazz also as music. Secondly, translations of such strange sayings generally do not have one-to-one equivalent in another language which usually results in misunderstandings. Mr. Çelik finished his talk with an important message for the children in Syria where the war is going on. The other Turkish speaker was the famous stand-up comedian Cem Yılmaz. He was too entertaining and funny as expected. We used to hear his shows and small jokes during interviews in Turkish but it seems that he can easily be successful in the international league considering the audience's reaction. He was also so successful on murmuring the melody of a tune by Marcus Miller. Thelonious Monk Jr. and Martin Luther King III were other international names who made speeches between performances. Now it is of course time to talk a bit from perspective of a listener. Who could join this event? How was the organization seen on the audience's seats? How did the performances sound? Even the concert is scheduled a long time ago, the announcement of the concert were too thin until the official press conference is made. Thus, considering also the size of Hagia Irene, I had already guessed that this concert would be a special, closed-to-public and VIP event. Despite this fact, I scheduled my flight from Ankara to İstanbul. I was angry with the organization first and complained about this to many of my friends from jazz scene in Turkey. Then I, like many members of today's human clan, decided to forget others and tried to find an invitation just for me. As some of you know (but popularity of the subject may gather new readers) besides my profession in electronics, I am a kind-of unofficial jazz writer in Turkey and write concert previews, reviews and interviews from time to time in most popular jazz portal of the country which forces me to make many travels generally within a day. The natural result of these connections may be seen to mean an automatic invitation for the all-star concert. However, this is not the case. I could not find it from my friends in Turkey. Fortunately, thanks to a concerned international contact, I could find the opportunity to have my name put on the list. This was what happened before I found myself in front of the door of Topkapı Palace which is guarded by two soldiers and two bodyguards on April 30th. At first try, since I do not have a printed invitation, I could not manage to persuade any of these guys. The main reason for the problems I have faced that there were no one from organization having an invitation list at the outermost door. By the way, I should mention that I really do not know who is responsible for which part of the organization and who are given invitations. The only thing I know is when I entered to see the invitation list after my all attempts and having given my name also to Branford Marsalis to give it someone inside, I could find my name out there and took a small yellow card from the guy responsible for this list. Then, at last, I was sitting at the far back of the hall next to some guys from Thelonious Monk Institute from US. I really do not want to give other important names that shared these back seats with me but I really felt myself lucky to have at least been inside. When we come to the sound, from my bad position in the hall, I have to say that, as soon as the performances started we were a bit disappointed with what is coming from the stage as sound waves. I was not sure about the reasons behind, but the sound design was not what should be in such an important event. After having listened to the performance again from youtube I thought that most of the problems may have been resulted from microphone placements. You will certainly understand what I am trying to say when you will especially listen to the second piece. There were many problems with these microphones one of which caught Herbie Hancock during his speech as clearly seen in the video. I know that the hall is too reverberant, but as far as I have seen this has been a problem just for some cymbals in the drums. In some performances mainly piano and bass partitions were inadequately delivered. Of all performances, in my opinion, there was a single totally perfect sounded one, which belongs to John McLaughlin, Zakir Hussain and Jean-Luc Ponty. Please know that I have given my above comments just as side information. Only seeing these legendary musicians on the same stage is a fabulous event for me. I just would like this to be a monumental event of music whose raw material is sound. As a brief summary, I certainly see this night an unforgettable one for Jazz in Turkey and think that it would be far better if it could have been public. As you all know, jazz is freedom and freedom needs free men that can share feelings of each other without any VIP borders.